Navegantes is a coastal and tourist city located in Santa Catarina state, southern Brazil. To find reviews, photos, where to stay, and tourist information, refer to the Navegantes trip maker website . Rio de Janeiro to Navegantes is an approximately 6-hour flight. You can also drive. Traveling from Rio de Janeiro in May, expect Navegantes to be a bit cooler, temps between 27°C and 20°C. On the 26th (Sun), you'll travel to Balneario Camboriu. You've added Barco Pirata, Molhe - Barra Sul, Cristo Luz, and other attractions to your itinerary. There's still lots to do: enjoy the sand and surf at Central Beach and don't miss a visit to Avenida Atlantica. For reviews, other places to visit, more things to do, and other tourist information, use the Balneario Camboriu route builder site . You can drive from Navegantes to Balneario Camboriu in an hour. In May, daytime highs in Balneario Camboriu are 27°C, while nighttime lows are 20°C. Finish up your sightseeing early on the 29th (Wed) so you can go by car to Penha. Start off your visit on the 29th (Wed): examine the collection at Oceanografico Univali Museum. Get ready for a full day of sightseeing on the next day: get in on the family fun at Beto Carrero World. For traveler tips, reviews, other places to visit, and other tourist information, refer to the Penha sightseeing planner. Penha is very close to Balneario Camboriu. May in Penha sees daily highs of 27°C and lows of 20°C at night. On the 1st (Sat), you'll travel to Blumenau. 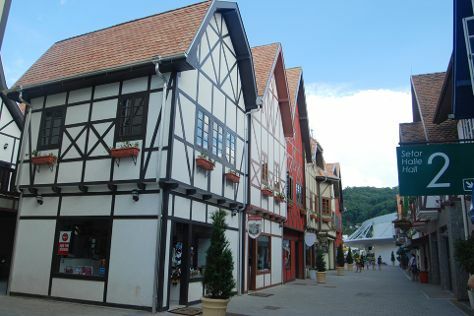 Founded in 1850 by a dozen German immigrants, Blumenau remains a place apart from the rest of Brazil largely thanks to its distinct European culture, architecture, and cuisine. Attractions like Zoo Pomerode and Vila Encantada make great kid-friendly stops. Get out of town with these interesting Blumenau side-trips: Pomerode (Museu Pomerano - Centro Cultural de Pomerode & Portal Turistico Sul). Plan for a day of cool, family-friendly fun on the 4th (Tue) at Parque Aquatico Cascaneia. There's much more to do: let the kids burn off some steam at Vila Germanica Park, admire the landmark architecture of Catedral Sao Paulo Apostolo - Igreja Matriz, tour the pleasant surroundings at Parque Ramiro Ruediger, and get a sense of history and politics at Blumenau City Hall. To find traveler tips, more things to do, other places to visit, and other tourist information, use the Blumenau holiday planner . You can drive from Penha to Blumenau in an hour. Another option is to take a bus. In June, daily temperatures in Blumenau can reach 24°C, while at night they dip to 17°C. Wrap up your sightseeing on the 5th (Wed) early enough to travel to Navegantes. For more things to do, other places to visit, traveler tips, and tourist information, refer to the Navegantes route planner. You can drive from Blumenau to Navegantes in 1.5 hours. Wrap up your sightseeing by early afternoon on the 5th (Wed) to allow enough time to travel back home.